When a game is made about a city and carries the name of that city, I and many other gamers are suspicious. Too many of those games are either Monopoly variants or simply not very good. There are exceptions of course, but we’ve grown cautious. After seeing the first photos of Québec, I was absolutely certain that it was not even close to a Monopoly variant. After hearing the explanation from Philippe Beaudoin in Essen and losing miserably against him – although he did admit to making up rules to win – I was just as certain that it wasn’t in the second category. Québec seems a bit threatening when you first look at it. The game that is, not the city. There is a bunch of paper discs in four different colours spread all over the board, each with three white squares, grouped in triangles around solid fields of their respective colour showing arcane symbols. The only thing recognisable as a part of the city is the Citadelle. After the explanation and the first round of the game, I felt much less intimidated. All those paper discs are in fact buildings to be, and the three squares on each are three stages of completion, built by our workers. Ah, worker placement then, I hear you say. Yes, you’re actually saying that loud enough for me to hear. In the past, when I’m writing this. But Québec is not so easily classified, workers are only a part of it. Workers can only work on a building that currently has an architect. Like in real life good architects are expensive, so each player can afford only one. Once a construction site is under professional supervision, you can start sending workers there. So, I’ll place my architect and then spend three turns sending workers to his place? You could, but it’s not very effective: each building grants you an action, marked by the symbols on the central circle, and you can only execute that action when the building you place your workers on is not your own. You don’t really want to miss out on those actions, most of them are rather convenient: gain additional points, place additional workers, place workers into one of the scoring zones. So, I’ll place my architect and then move workers to an opponent’s building with an attractive action? Closer, but that’s still not all: each building also has a colour, and when construction is finished – when the owner removes their architect – the workers on it will go to the matching zone of influence where they will count points at the end of the century. So, I’ll be putting my workers on a building with an attractive action and a good colour, then? Mostly yes, but you also need to remember that finished buildings count the most points for their owner at the end of the game, so you want to have your own buildings finished but force your opponents to abandon theirs before all three spots are filled. Then there’s still the problem of the active workers. Most workers are passive at any given time – like me at the office – but you need them to be active to be able to place them on the board. The most common way to activate workers is to move your architect, always activating three of them. And at that point you want some workers on his building, if there are none you don’t get to place your marker, potentially interrupting your area of connected building and losing a lot of points. By now you should have realised something very fundamental about Québec: it’s a game of many layers. Most games with any depth base it on long-term planning: to play well, you have to prepare what you want to do many turns in advance. Not so in Québec; you are rarely able to plan more than two turns ahead, the depth comes from the consequences every action has. Placing your workers gives you a special action or a completed stage of your building as well as some workers in one of the zones of influence. Placing your architect offers a new special action to the other players, but that action might convince them to build your building for you. But you also want to place your architect close to the buildings you already have as the largest area you have will score more points in the end. There is many details to consider. And we didn’t tell you half of it yet. Even in the normal game, there are the five leader cards. Instead of placing your architect or some workers, you can chose to pick up a leader card that grants some new action yet again. The most straightforward one lets you place three workers in the Citadelle to score, the others give you a second architect to employ, let you decide where your workers go when a building is finished, score points when one of your buildings is finished or let you use the action when working on your own building. Taking a leader also lets you activate a worker for each player that chose a leader card before you – which leader to pick and when is not a simple decision, either. If you’re playing the advanced game, there is one more element to add: event cards. For each of the four centuries, one of a small selection of event cards is drawn at the beginning of the game. The event cards add additional scoring opportunities, make it impossible to take leader and some other more or less fun effects to consider. Oh wait. Did I just mention centuries for the first time? Québec is played in four centuries – I’m glad we cleared that up. Each building belongs in one century and can only be started then. 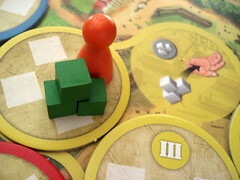 When all buildings for one century are completed or under construction, or when a player starts his turn with no active or passive workers, the century ends immediately and points are awarded. Scoring is yet another thing you want to keep in mind at all times, and maybe the only thing you don’t fully grasp until after the first century, when you saw what happens. Scoring always starts with the Citadelle and then goes on with the four zones of influence, starting with a different one each century. Each worker is worth one victory point. But that’s not all, because from each zone the player(s) with the most workers there moves half of his cubes to the next zone. There they score again and move on to the next zone again if they are still in the majority. When prepared right, if you just have the majority in the Citadelle your workers can cascade all the way through the zones. It’s a beautiful thing to watch. It’s a great mechanism, an easy way to make majorities count for something extra. On the downside, as the century nears its end some players tend to spend a lot of time counting cubes to figure out where adding one will still make a difference. The end-of-the-century scoring happens four times in the game. Additionally, all your finished buildings score points once at the end of the game. The markers you place on your finished buildings show one, two or three stars and the numbers one, three or six. For the biggest area of connected buildings you own, you gain points for the number, for all other buildings only by the stars. That’s why you want to keep your buildings close together when you can, this final scoring can make a big difference. For all our test games, it was always the new players that excelled at this part of the game, with the more experienced players scoring more points in the four centuries but less at game’s end. For two players, Québec changes a little. Having just two architects on the board would be to boring, the decision whether helping your opponent finish his building is worth having the action or not would be too flat. To counteract that, the role of the neutral architect changes: instead of being selected as a leader, he’s now always on the board. He moves every time another architect is moved – unless his current building has no workers yet – and his buildings are owned by the last player to place workers there. Instead of trivialising a part of the game by lack of options, Québec adds another layer to the already impressive stack of things to consider when choosing your move: ownership of the neutral building. Québec in two players plays well, if a bit different from the variant with three or more. With the neutral architect changing every time another architect changes their position, the game is actually shorter. However, but you will spend more time counting cubes in the zones of influence because either you or your opponent will cascade their workers, with three or more players you can more easily afford to neglect one zone because the profit from it might not all go to the same player. 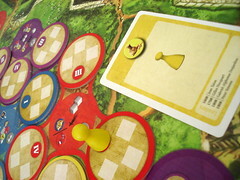 Québec in two players is well worth planning, but we all here agreed that we prefer it with more people. Describing the rules, Québec sounds like a very convoluted game. As a matter of fact, it isn’t. There are many details to consider strategically, but the rules are streamlined and easy to pick up. When it’s your turn, you move your architect, place workers or pick up a leader. That’s it. 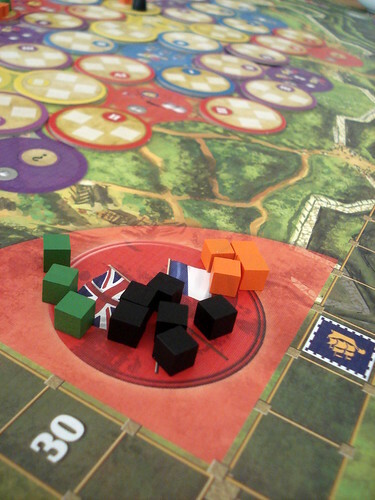 Each turn is very short – except when players start counting cubes – and you have very little downtime to worry about. Thanks to the randomness in the setup, it’s also guaranteed that you’re never going to play the same game twice. At the same time, as soon as the game starts you’re in a perfect information situation. The best of both worlds. Québec‘s visual design is great in how it represents information. The iconography is very clear, you never have to wonder what action you will get, one look at the picture tells you what you need. After the first game, you won’t need the manual. At least at the beginning of the game, the environment on the board is drowned out: everything is occupied by vaguely intimidating discs. As you construct buildings around the city, everything looks less abstract and more like a real place: each disc shows a significant place or building from the city of Québec – except for one that is from somewhere in the state of Québec, or so we’re told – making the game look much, much nicer towards the end. Those pictures are the main thing tying the game to the city, with a bit of support from the names of the leaders and the two sentences of description on the event cards. Despite this rather vague connection to Québec, Philippe and Pierre have figured out the perfect way to pay homage to a city in a boardgame: make the game carrying the city’s name a great one.